I love Hourly Comics Day! On February 1st, many cartoonists take to Twitter or Instagram to draw comics detailing what happened during each hour of their day. There are no rules regarding format, style or consistency; some draw on post-it notes, take pictures of their sketchbooks, do fully shaded, multi-panel comics – anything goes! Hourlies, to me, have an appeal similar to perzines (personal zines that can be diary-like). The time constrains keep them raw and fresh, and give a unique look into the daily lives of a huge group of people who share only comics in common. Well, comics…and cats. I may personally be known to have an interest in the intersection of comics and cats, but I’m not alone! Lots of cartoonists draw and/or write about cats, and hourlies are an ideal place to capture the strange, silly, and frustrating daily cat-trials through which we must survive. Line work genius Trungles also picked up on this and made his own list of domineering cats, so I opted to list different artists! Please also check out Trungles’ list, it’s very good. The cat alarm clock is one of the most common cat experiences. Sleeping schedule? What sleeping schedule? You sleep until your cat decides you are done and it is time to be AWAKE. Maybe your pets are small, quiet, baby angels, but my cat is BIG and LOUD. “She wait, she scream” is one of the most relatable comics I’ve ever read. I have a morning routine with my cat that involves telling her, multiple times, how much I love her and…well, it’s maybe a bit embarrassing. Princie’s head boop routine is both familiar and utterly charming. Cats are great stress relievers because they’re fuzzy and sweet and loving! Cats are also great stress inducers when they seem to be screaming about something they want but you can’t figure out, or suddenly you realize you haven’t petted them in a long time and they maybe feel neglected or…well, you get the idea. I felt this comic by Sage Coffey captured both feelings. She’s mostly gotten over it, but my cat used to have a lot of feelings about the broom. Was it a toy she could play with, or some kind of possibly murderous brush monster?! Cats and their feelings can really get in the way of your chores. Sometimes your cat is actually perfect. They’re just there when you need them, in orbit around you but not suddenly appearing right behind your legs when you’re standing at the kitchen counter holding a sharp knife. No, these cats know just how to be near you but out of your way, ready to get head scritches and pats. I love Linnette’s ever-present cat. A while back, I foolishly followed a cat shelter on Facebook. Sometimes you see a cat that just seems so perfect and adoptable, and then you remember that your cat has an expensive chronic illness, is A Handful, and hates other cats. We can all cry along with Musa. 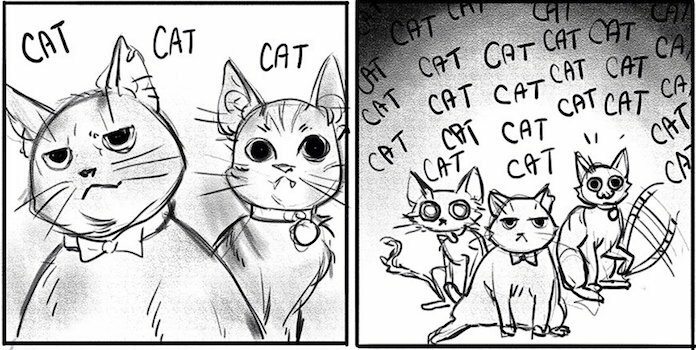 I’ve been loving Knisley’s comics about Pal, her adorable toddler, but I was really excited to see her cat Linney make an appearance in her hourlies! Kinsley dove into her colored pencil stash to capture the magnificence of a creature that, honestly, is just too good for us. Our lowly human senses are too dull to allow us to appreciate just how perfect they are. Shing Yin Khor – Has…a Dog? OK yes, geeze, I hear you, I realize not all comics-lovers are also totally obsessed with cats! Fortunately for y’all, Shing Yin Khor has the cutest scruffy pup who she took a hug-break with on Hourly Comics Day. I may not have a dog, but I definitely have felt that urge to just stay and protect my big chunky cat, especially when she’s sick. Perhaps you do love cats and comics, but don’t have a cat of your own! Be like color pencil connoisseur Mel Gillman. Soak up the sun, be the cat. Here’s a secret – hourlies are also a great way to discover a new, favorite artist! If you like their adorable cat illustrations, you’ll certainly enjoy these cartoonists’ webcomics, books and enamel pins. Check out their work, and if you found a new, awesome artist on Hourly Comic Day, share them in the comments!